What this means to you is Snipplr (and other websites with searchable content) can be searched directly from Firefox’s search box. There’s no need to first go to Snipplr and then do a search. Now you can search from inside your browser no matter what site you’re currently on. Here’s how it works. Using Firefox 2.0, go to Snipplr.com – you’ll see the small arrow next to Firefox’s search box light up. Click on the arrow and choose “Add Snipplr” to add it to your list of search engines. Now, you can search Snipplr using Firefox just like you do Google. Snipplr will even suggest searches as you type them! 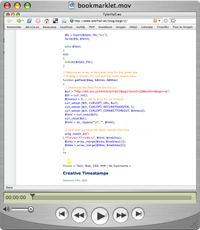 Here’s a short screencast showing the whole process in action. The Snipplr WordPress plugin gives you an easy way to embed snippets inside your blog posts or add a list of your recent snippets to your blog’s sidebar. My thanks go to Jan StÄ™pieÅ„ for coming up with the initial idea for this plugin and writing the first version. 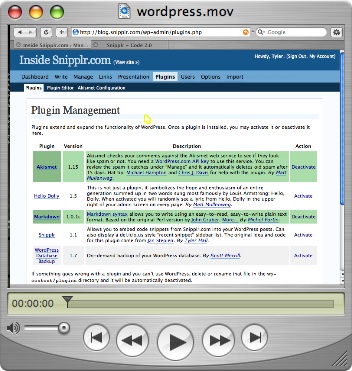 Here’s a screencast of the plugin in action.